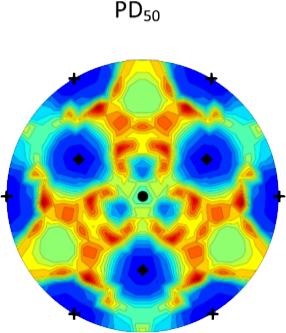 The Atomistic Simulation Group headed by Professor Robin Grimes is based in the Department of Materials at Imperial College London. We use various simulation techniques to predict the atomic scale mechanisms and processes underpinning material properties in order to improve the understanding and design of new materials. New Paper - "Fission Gas in Thoria"
Our recent computational work using density functional theory on “Fission gas in thoria” has been accepted and is now available from the Journal of Nuclear Materials. This study uses first-principles density functional theory together with a dispersion correction (DFT+D) to calculate the energetics of neutral and charged point defects and defect cluster geometries in ThO2. It also investigates their interaction with Xe and Kr. ThO2 has been identified as a possible alternative nuclear fuel, partly because spent ThO2 fuels give rise to considerably smaller inventories of minor actinides, especially Pu. Furthermore, ThO2 is a highly stable oxide, and exhibits higher thermal conductivity, higher melting temperature, higher corrosion resistance and lower thermal expansion compared to UO2. At high fuel temperatures, fission gas atoms migrate and are accommodated at point defect sites in the fuel matrix. Over time some of these aggregate into bubbles. Formation of bubbles is important as it leads to swelling and degrades mechanical properties of the material. In order to understand fuel performance, it is necessary to understand the interaction of gas atoms with point defects. New Paper - "Thermophysical properties and oxygen transport in (Thx,Pu1−x)O2"
Using Molecular Dynamics, this paper investigates the thermophysical properties and oxygen transport in (Thx,Pu1−x)O2 (0<x<1) between 300–3500K. In particular, the superionic transition is investigated and viewed via the thermal dependence of lattice parameter, linear thermal expansion coefficient, enthalpy and specific heat at constant pressure. Oxygen diffusivity and activation enthalpy are also investigated. Potential parameters have been derived for Xe and Kr in CeO2, ThO2, UO2 and PuO2. The CRG model for actinide oxides has been effective at reproducing a wide range of properties for actinide oxides and CeO2. Many problems relating to fuel performance revolve around the behaviour of the fission gases Xe and Kr in nuclear fuel. We have, thus, used a new approach, which combines DFT with MD at 300K, 1500K, 3000K and 5000K, to develop interactions for Xe and Kr in CeO2, ThO2, UO2, PuO2, and mixed oxides. The website has been updated to include the new parameter set. Additionally, the support files for LAMMPS have also been updated. Visit the fission gases potential page for more information. Visit the actinides potential page for more information. Former PhD and CNE student Patrick A. Burr was recently appointed Lecturer in Nuclear Engineering at the University of New South Wales (UNSW), Sydney, Australia. There, he coordinates and teaches on the MEngSci in Nuclear Engineering that was launched two years ago with the support of Robin Grimes and other colleagues from Imperial College’s Centre for Nuclear Engineering. The appointment is a joint position with the Australian Nuclear Science and Technology organisation (ANSTO), providing world-class nuclear research facilities. New Paper - "Simulations of Threshold Displacement in Beryllium"
M.L. Jackson, P.C.M. Fossati and R.W. Grimes, “Simulations of threshold displacement in beryllium”, Journal of Applied Physics, 120 (2016) 045903 doi:10.1063/1.4958974. Atomic scale molecular dynamics simulations of radiation damage have been performed on beryllium to calculate the threshold displacement energy. A geodesic projection of displacement directions was used to investigate the orientation dependence of the threshold displacement energy with respect to crystallographic direction with unprecedented spatial resolution. It was found that the directionally averaged probability of displacement increases from 0 at 35 eV, with the energy at which there is a 50 % chance of a displacement occurring is 70 eV and asymptotically approaching 1 for higher energies. This is however strongly directionally dependent with a 50% probability of displacement varying from 35 – 120 eV, with low energy directions corresponding to nearest neighbour directions. A new kinetic energy dependent expression for the average maximum displacement of an atom as a function of energy is derived which closely matches the simulated data. New Paper - "Resolving the structure of TiBe12"
M.L. Jackson, P.A. Burr and R.W. Grimes, “Resolving the structure of TiBe12”, Acta Crystallographica Section B, 72 (2016) 277. doi:10.1107/S205252061600322X. 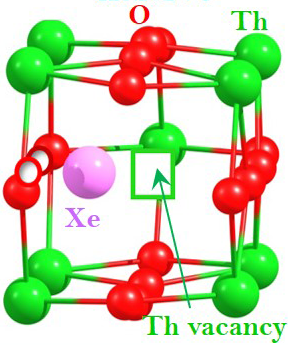 A new family of intermetallics, Be12X (X = Ti,V,W,Mo) have been proposed to replace Be in nuclear fusion applications due to improved radiation tolerance and operating temperatures, the most promising of which is Be12Ti. In order to further investigate this material, we have first clarified the structure. There has previously been considerable controversy regarding the structure of TiBe12, which is variously reported as hexagonal and tetragonal. Lattice dynamics simulations based on density functional theory show the tetragonal phase space group I4/mmm to be more stable over all temperatures, while the hexagonal phase exhibits an imaginary phonon mode, which, if followed, would lead to the cell adopting the tetragonal structure. We then report the ground state elastic constants and temperature dependence of the bulk modulus and thermal expansion for the tetragonal phase. We would like to congratulate Patrick Burr in completing his PhD on Ab-initio modelling of Zr and Be alloys for nuclear applications. His work on zirconium alloys has identified a novel mechanism responsible for the microstructural evolution of nuclear fuel cladding due to irradiation. This knowledge may provide the basis for the development of improved Zr fuel cladding with higher radiation tolerance and corrosion resistance. At the same time, his work on beryllium alloys (used in satellite components and fusion reactors) showed that the mechanical and chemical properties of the metal may be improved by carefully alloying with small additions of Fe. Read more about his thesis here page. Dr. Michael Cooper has now left the group to take up a position at Los Alamos National Lab in the United States. 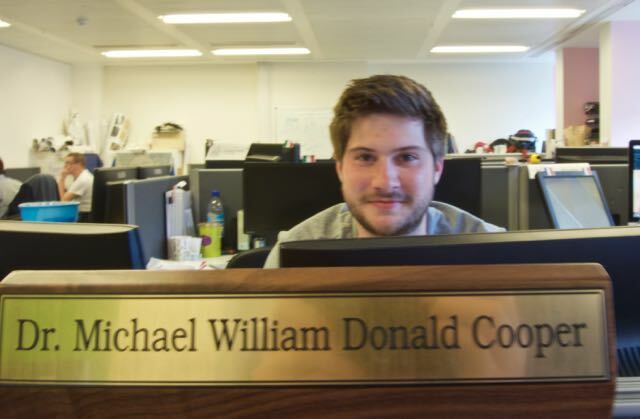 Throughout his PhD Michael did a sterling job in improving our understanding of the behaviour of spent nuclear fuel and actinide oxide systems in general and will be sorely missed. We’re sure he’ll keep up the good work in his new role across the pond and our best wishes go with him. Secondly we would like to welcome our newest PhD student, Conor Galvin, who joins us from Imperial’s MSc in Nuclear Engineering. He will be picking up where Dr. Cooper left off, by considering the behaviour of mixed oxide nuclear fuels using atomic scale simulation. We would like to congratulate Michael Cooper who was successful in the recent defence of his thesis entitled Atomic Scale Simulation of Irradiated Nuclear Fuel. His work focused on using static and molecular dynamics calculations to study the role of temperature and non-stoichiometry in conventional and advanced nuclear fuels. The project culminated in the development of a many-body potential model that was used to study the behaviour of mixed actinide oxide systems. We are pleased to announce that Dr. Michael Cooper has given us permission to make his thesis available in PDF form on our theses page. Click here to access the thesis. New Paper - "Effects of Gallium Doping in Garnet-Type Li₇La₃Zr₂O₁₂ Solid Electrolytes"
The paper is the result of an ongoing collaboration between the group and Dr. Randy Jalem. Randy originally spent several months with us at Imperial whilst visiting us as a PhD student from Nagoya Institute of Technology (Japan) and we would like to thank him and the other authors for all their hard work in bringing this to completion. 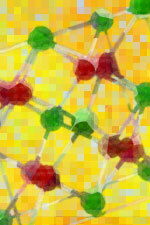 LLZrO is a candidate for use as solid electrolytes in battery applications. The effects of Ga doping on the structure are considered. Ga is found to stabilise the cubic phase. The connectivity of Li percolation networks in LLZrO are visualised.